Bangin Bus Tours specialises in party bus hire and bus tours for clients on the Central Coast, Hunter Valley and Sydney. If you are looking for a party to remember, this is the party bus you have been looking for. Our professional drivers will take your party anywhere in our specialised party bus. Whether it is a Hunter Valley wine tour, a bucks party or hens night, or any special event, Bangin Bus Tours will pick you up, drop you off and drive you home! Or you can just stay on the bus! Your party should reflect your personality. With this goal in mind, we spend time listening to you and understanding your needs. Our drivers will use their experience and expertise to make your dream event a reality. From a bus trip to the races to a simple trip to the Hunter Valley wine region, our focus is always on quality and customer satisfaction. As your most trusted company on The Central Coast and Hunter Valley area, we know how to make our clients happy. We guarantee to always meet the customers' needs. Our specialised party bus and drivers work to high standards that give clients superior quality events, parties and most of all... fun! Trust Bangin Bus Tours to take care of your wine tour or bus hire. Our dedicated team will ensure that everything gets done perfectly. We look forward to hearing from you. 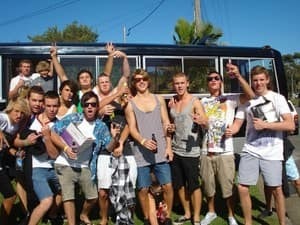 Best party bus on the Central Coast. We hired the bus to transport our guests to our wedding in the Hunter Valley and everyone still says that Bangin Bus Tours was the highlight of the wedding. Not only was the driver professional, but he let our guests do pretty much anything on the bus. I wish I was having another wedding so that I have another excuse to hire the party bus. 5 stars easy. Bangin Bus Tours are awesome!! 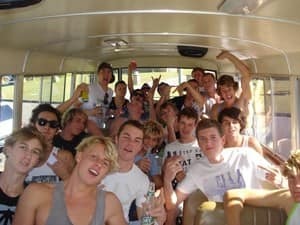 My mates and I had a bucks party on this bus and the trip to Sydney from the Central Coast was epic!! Loud music, fun driver, absolutely amazing party bus!! I highly recommend this party bus to everyone! !